I’ve been working on a little story (which has slowly, and against my will, turned into a big story) for a while now, and I thought it was about time I introduced its heroine to the world. Meet Merona Grant. 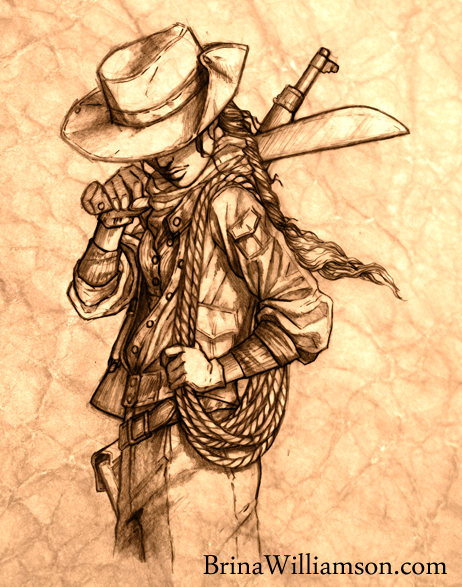 Adventuress, and treasure hunter for hire, with a predisposition for receiving black eyes, and a rifle which she keeps cleaner than she keeps herself. This sketch is one of the first I ever did of my leading lady, and though her final design differs quite a bit from this one, this image was what stood as my main visual inspiration while writing the initial draft of my story. So, who is Merona you ask? Oh, you didn’t? Well, I’ll tell you anyway. Merona is the adventuring heroine I’ve been waiting to read about since I was… let me think… like nine years old. She’s as straight shooting with her words, as she is with her gun, can handle herself in a scrape (even if she herself gets scraped up in the process), hates bathing as much as I did at nine, and lives a life sleeping under the stars alongside her scruffy companion, a mongrel-dog who sticks to her side like glue, but rarely listens to a word she says. I have numerous rereads, edits, and concept art to complete before you will have a chance to get to know her as well as I do. But until that time comes, you can feel free to gaze at her picture (if you’re inclined to do that sort of thing) and try your best to see past the brim of her hat for hints of her unseen depths, and, as yet, unrevealed adventures.